A rare agarwood species known locally as Karas Gunung or Chandan Gunung and scientifically as Aquilaria rostrata was first identified in 1911 in Gunung Tahan, in Pahang state. It then promptly disappeared from sight and was presumed extinct. Until now, that is. Researchers from Universiti Putra Malaysia have rediscovered the elusive agarwood tree around 100 kilometers away in a forest in Besut, Terengganu, during a field trip in the area. 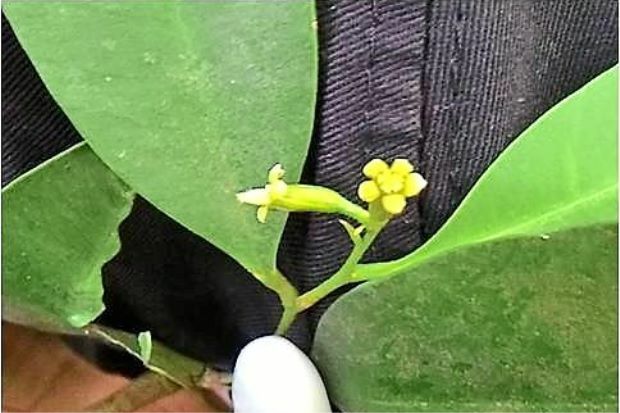 “At first, we thought that it was a new species but after making comparisons with a 100-year old specimen at Herbarium Botanic Gardens, Singapore, we discovered that it was the A. rostrata,” said Dr. Rozi Mohamed, an associate professor at the university’s Department of Forest Management. Dr Mohd Nazre Saleh, another associate professor at the university’s Department of Forest Management, hailed the discovery of the tree long thought to be extinct as a significant find for botanists, not only because of its rarity but also because it has resurfaced elsewhere from where it was first found. The species is protected under the Convention on International Trade in Endangered Species of Wild Fauna and Flora and listed as “critically endangered” under the International Union for the Conservation of Nature Red List.” The tree was driven into extinction at the site where it was originally discovered likely as a result of logging by timber companies, which highly prize rare agarwood. Rozi wants to see the newly rediscovered trees protected from “unscrupulous quarters out to get hold of agarwood.” Indeed.